An intense fear grips to a mother senses, as the rain poured heavily and the winds grew stronger battering their defenseless home. She hurriedly packed their things to move out to a safer place. They left their house and sought for stronger and larger place to get away from danger. This is always the state of Erlinda, 60, whenever a typhoon strikes their place. 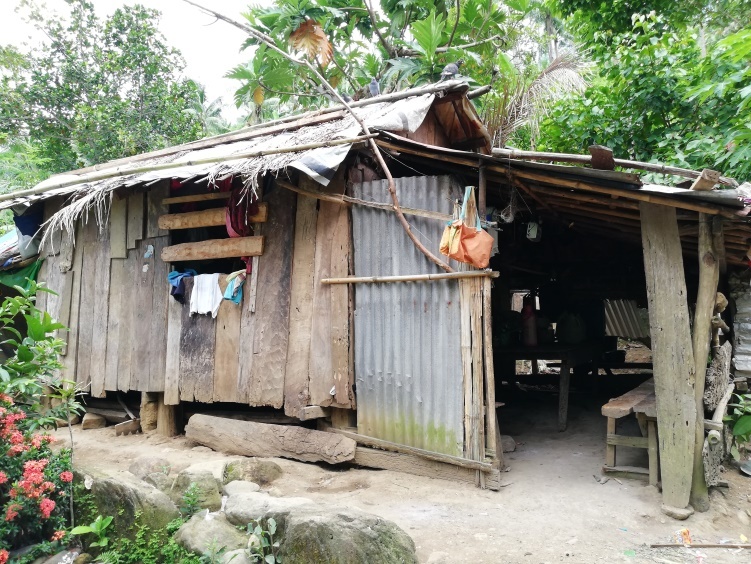 Their small and makeshift house can be reached after 15 to 20 minutes of walking, crossing three rivers from Barangay Poblacion. A remote barangay, Mayong valley of Tiwi town is the provincial boundary of Albay and Camarines Sur. It shares a common border with some barangays of Buhi and Sangay, Camarines Sur. When typhoon Nock-ten also known as Nina pounded Albay and the rest of the Bicol region on Christmas night of December 2016, Erlinda and her family experienced storm’s rage again. According to Celso Bequillo, Barangay Secretary, their barangay has no evacuation center. Households only rely on those kind-hearted families who would open their housesto affected families during a disaster. When the storm finally calmed down and the water receded, she and her husband Nestor quickly checked their house and were dismayed on what they saw. Instead of grieving, the family focused on rebuilding their house. They are lucky and thankful that all of them made it out of the storm safe. In order to have a place to stay, they need to look for materials to build a new home. It was devastating but the family needs to move on and be resilient for them to survive. So after constructing their house, her husband and her son went back to Camarines Norte where they work and earn a living as fishermen. Meanwhile, Erlinda had to take care of her two grandchildren whose parents are also working in Manila. Erlinda was worried that time, not knowing when they will be able to rebuild their own house, a stronger and well-made one. During the conduct of the interview, she could hardly feel her profound happiness, thinking that they will receive some assistance from the government. When Erlinda received the cash aid from DSWD’s Shelter Assistance amounting to P30, 000. Her sister, who is also a recipient decided to give to her the amount that she received so that they can buy lumbers and other materials for the construction of the house. They agreed to combine the assistance that they received to finance the house construction. The DSWD’s Emergency Shelter Assistance (ESA) is part of the rehabilitation efforts of the agency to help “Nina” affected families rebuild their homes. It enables them to purchase shelter materials required in constructing or repairing their damaged houses as a result of the disaster.